Our first survey of the lesbian, gay, bisexual and transgender community examines their attitudes, experiences and values in today’s changing times. 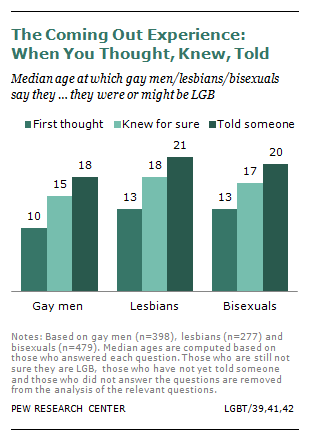 The survey found 92% of LGBT adults saw a society that had become more accepting of them in the last decade. But about half said they still experienced discrimination. Explore more LGBT voices describing the experience and milestones of the coming out process. Are you lesbian, bisexual, gay or transgender? Is your son or daughter, brother or sister, cousin or friend LGBT? Join the conversation and tell us your stories in the comments section below.